"Doing geoengineering means often considering the unthinkable," says Moore, a scientist at Beijing Normal University, China, and a professor of climate change at the University of Lapland, Finland. The term 'geoengineering' is usually applied to large-scale interventions to combat climate change. But instead of trying to change the entire climate, Wolovick and Moore say we could apply a more targeted approach to limit one of the most drastic consequences of climate change: sea-level rise. Their "unthinkable" idea is glacial geoengineering: making changes to the geometry of the seafloor near glaciers that flow into the ocean, forming an ice shelf, to prevent them from melting further. 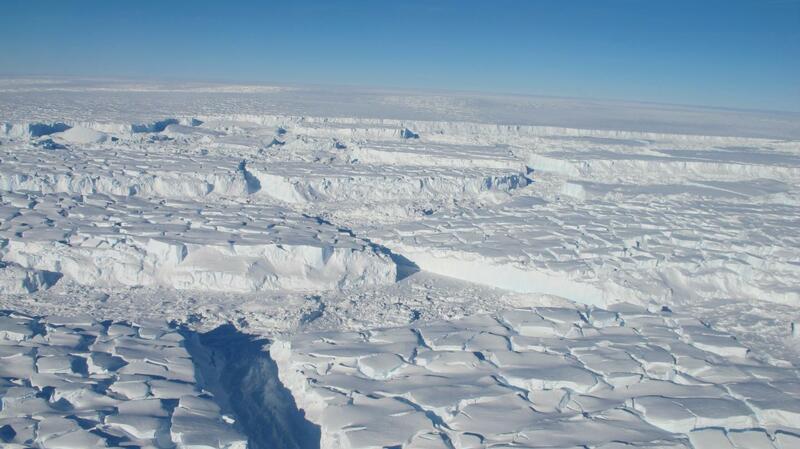 Some glaciers, such as the Britain- or Florida-sized Thwaites ice stream in West Antarctica, are retreating fast. "Thwaites could easily trigger a runaway [West Antarctic] ice sheet collapse that would ultimately raise global sea level by about 3 metres," explains Wolovick, a researcher at Princeton University's Department of Geosciences, US. This could have dramatic effects to the millions of people living in the world's coastal areas. Instead of, or in addition to, limiting the effects of rising seas through traditional coastal protection, using glacier geoengineering to stop the flood at the source could be a viable option, as Wolovick and Moore show. "The most important result [of our study] is that a meaningful ice sheet intervention is broadly within the order of magnitude of plausible human achievements," says Wolovick. The team looked into two glacial-geoengineering designs. One idea would be to build a wall underwater to block warm water reaching an ice shelf's base, which is very sensitive to melting. A simpler design consists of constructing artificial mounds or columns on the seafloor: they wouldn't block warm water but could support and hold back the glacier, helping it regrow. "In either case, we were imagining very simple structures, simply piles of sand or gravel on the ocean floor," says Wolovick. The team ran computer models where they applied these designs to Thwaites Glacier in a warming world. Thwaites is projected to be the largest individual source of future sea-level rise and, at 80 to 100 km wide, it's one of the widest glaciers in the world. "If [glacial geoengineering] works there then we would expect it to work on less challenging glaciers as well," the authors write in The Cryosphere study. The research shows that even the simpler design could slow down the rate of sea-level rise, giving more time to coastal societies to adapt to rising waters. The smallest intervention has a 30% probability of preventing a runaway collapse of the West Antarctic Ice Sheet for the foreseeable future, according to the models. This intervention would consist of building isolated 300-metre-high mounds or columns on the seafloor using between 0.1 and 1.5 cubic kilometres of aggregate, depending on the strength of the material. This is similar to the amount of material that was excavated to build the Suez Canal in Egypt (1 cubic kilometre) or used in Dubai's Palm Islands (0.3 cubic kilometres). Despite the encouraging results, the scientists say they don't advocate starting these ambitious projects any time soon. While the simplest design would be similar in scale to existing engineering projects, it would be built in one of Earth's harshest environments. So, the engineering details still need to be worked out. Nonetheless, the team wanted to see whether glacial geoengineering could work in theory, and wanted to get the scientific community to think about, and improve on, the designs. "We all understand that we have an urgent professional obligation to determine how much sea level rise society should expect, and how fast that sea level rise is likely to come. However, we would argue that there is also an obligation to try to come up with ways that society could protect itself against a rapid ice-sheet collapse," says Wolovick. Ice physics shows glacial geoengineering could work to hold off ice-sheet collapse, but both Wolovick and Moore are adamant that reducing greenhouse-gas emissions remains a priority in the fight against climate change. "There are dishonest elements of society that will try to use our research to argue against the necessity of emissions' reductions. Our research does not in any way support that interpretation," they say. Engineering glaciers would only limit sea-level rise, while reducing emissions could also limit other harmful consequences of climate change, such as ocean acidification, floods, droughts and heat waves. In addition, the team points out that more warming would mean glacial engineering projects would become less feasible and would have lower chances of success. After all, their underwater structures might protect the bottom of the ice shelves, but wouldn't prevent warm air from eating away the ice at the top. "The more carbon we emit, the less likely it becomes that the ice sheets will survive in the long term at anything close to their present volume," Wolovick concludes.